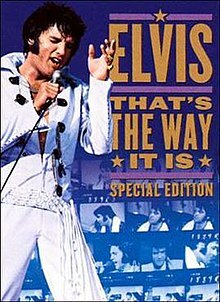 Elvis: That's the Way It Is is a 1970 American documentary film directed by Denis Sanders. The film documents American singer Elvis Presley's Summer Festival in Las Vegas during August 1970. It was his first non-dramatic film since the beginning of his film career in 1956, and the film gives a clear view of Presley's return to live performances after years of making films. The film was released simultaneously with Presley's similarly titled twelfth studio album, That's the Way It Is. The original concept as devised by technical advisor Colonel Tom Parker was in view of Presley's triumphant return to live performances was a closed circuit television presentation of one show. The opening credits sequence contains footage of Presley's show at Arizona Veterans Memorial Coliseum in Phoenix on September 9, 1970. This was the first show of Presley's first tour in 13 years. Presley and his band are seen rehearsing for the Las Vegas engagement at MGM Studios in Culver City, California. There are scenes of Presley running through such tunes as "I Just Can't Help Believing", "What'd I Say", "Little Sister", "Words", "That's All Right Mama", and "The Next Step Is Love." Presley and his group are also heard performing a tongue-in-cheek rendition of "Crying Time". The rehearsal sequences were filmed during late July 1970. Later rehearsals show Presley in Las Vegas with his back-up vocalists The Sweet Inspirations, Millie Kirkham and The Imperials, preparing songs such as "You Don't Have to Say You Love Me" and "Bridge Over Troubled Water". There is also a session of rehearsals that takes place in the Showroom Internationale of the International Hotel (now known as the Westgate Hotel and Casino) in Las Vegas. Together, Presley and the entire group run through songs from "Mary In the Morning" to "Polk Salad Annie". These rehearsals took place on August 7, 1970. Footage of an Elvis Appreciation Society convention in Luxembourg was shot on September 5, 1970. Radio Luxembourg DJs Tony Prince and Peter Aldersley are on hand to lead the festivities. A tandem bicycle owned by Presley is raffled off to a lucky fan in the audience. Additionally, various musicians are seen performing their own versions of Presley's songs. Presley is also seen relaxing in his hotel suite with various members of his entourage. The movie is also intercut with footage of fans offering commentary about what Presley means to them; officials at the International Hotel; and celebrities (including Sammy Davis Jr., Cary Grant, Charo, George Hamilton, Juliet Prowse and Xavier Cugat) arriving for opening night of the show. The special edition was released on January 19, 2001, when this new version made its worldwide debut on the cable network, Turner Classic Movies and produced by award-winning producer Rick Schmidlin. This page was last edited on 5 November 2018, at 23:45 (UTC).